Biere de Garde is one of those beer styles that simply doesn't get a lot of attention. I'm not sure if it's either the middle of the road characteristics (it isn't especially strong/hoppy/roasty/yeasty) or that it is often the odd one out as the only distinctly French style. Whatever the reason, it's unfair since Biere de Gardes provide some of the best examples of malt complexity. There are some great imported examples of the style available for under $10 for a 750 (3 Monts, Jenlain, and La Choulette) that are well worth picking up if you haven't tried them. 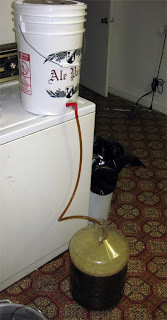 I've only brewed a Biere de Garde once before, and that batch was brewed to be blended into my Cable Car Clone. With a sack of French pils on hand and a yeast cake of the Wyeast Kolsch strain from my most recent batch of Kolsch, it seemed like the right time to give the style a real shot. My recipe is based heavily on reading the excellent Farmhouse Ales by Phil Markowski. According to the author the larger producers tend to employ simple recipes (almost all pils with a touch of dark malt for color and fermented warm with a lager strain), while smaller more artisanal producers go more complex (multiple specialty malts and fermented with ale yeasts). 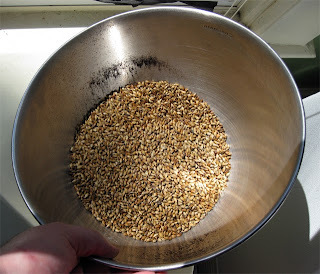 The malt bill I selected was a bit more complex than I usually aim for, but it was based on the simple idea of making the beer as toasty/bready/malty as possible with additions of Munich, biscuit, and home toasted malt (Maris Otter baked in a 400 degree oven for 15 minutes). Home toasting malt is an easy way to add a unique touch to a batch, and something I should do far more often. I went with a lower mash temp to help dry the beer out while preserving the malty flavors. For the hops I decided on Brewer's Gold, but just about any European variety would have worked similarly well with such small additions. Once fermentation is complete I'll lower the temperature close to freezing for a 4-6 week period of cold storage (which is what gives the style its name). 0.75 oz. Brewer's Gold (Pellet, 7.80% AA) @ 75 min. 0.25 oz. Brewer's Gold (Pellet, 7.80% AA) @ 20 min. 9/5/10 Toasted several cups of Maris Otter in a ~400 degree oven on a cookie sheet on my pizza stone, stirring every few minutes. The grain popped a bit, it was the last of the bag and seemed a bit spongy. Cooked faster than I expected, was ready after 15 minutes or so. Collected 7.25 gallons of 1.058 wort with a fly sparge. Could only chill to about 82, so I put it into the fridge set to 58 to drop the rest of the way below 70. Pitched ~1/2 the yeast cake 6 hours later,shook and gave 30 seconds of pure O2. Left ~1 qrt of trub out of the fermenter. Hooked up a blow-off tube. 9/12/10 Down to 54 for primary on the Smoked Baltic Porter. 9/17/10 Upped temp to 60 to help it finish out. 9/24/10 Racked to secondary, still has a krausen, still really yeasty looking. Took out from fridge left at ~75 ambient to finish fermenting before cold crashing. 9/27/10 Down to ~1.016 (78% AA, 7.7% ABV). Still young and yeasty, but it has a nice fresh bread character. 10/3/10 Dropped the temp to 35 to start dropping out proteins/yeast. Shooting for 6 weeks of lagering before kegging. 11/13/10 Looks pretty clear. Racked to keg, and put on @10 PSI to carbonate. 12/16/10 Ended up really solid. Moderate sweetness (on the high end of the style), great malt complexity, and subtle fruit character from the yeast. Weird, I was just looking into Biere de Gardes today as I've been surfing the interwebs for info on how to achieve that corked flavor that many Biere de Gardes and Fantome have. Look forward to seeing how this turns out. I think corking is part of it (obviously), but things like low level infections, and aged hops might be part of it as well. I remember reading a post from someone who was cutting up forks to add to their beer for aging… never heard how that turned out. I’ve got high hopes for this beer, but I’m not going out of my way to add to the musty/corked flavor. I always thought this style was something I wouldn't like - all the "Farmhouse" beers I've had have been pretty phenolic and/or horsey, neither of which I really like very much. But your recipe seems to indicate that perhaps I was wrong - I see nothing in there that could lead to the flavors I'd like to avoid. Looks quite nice in fact. Is yours a "traditional" take on this style? It has always been a bit strange to me that Saison and Biere de Garde are lumped together. While they have some similarities on the surface in terms of history and the sorts of breweries that make them, the beers themselves are very different. As you described saison does tend to be funky/spicy/fruity etc… while Biere de Gardes are pretty clean and more malt focused. This batch is pretty typical according to Farmhouse Ales, but my choice of ale yeast will actually give it more character than the standard choice of lager yeast at a slightly elevated temp. As DA said, some of the commercial Biere de Gardes do have a woody, corked, or damp basement character that some people enjoy that you may not. Give the style a try, but try to get a fresh bottle. The brewer at Southampton Public House wrote the Farmhouse Ales book, if you can find his version it is pretty good and is missing that corked character. thanks for the info...I just listened to Jamil's podcast on the style and again I see no reason why I wouldn't like this beer. I'll add it to the (growing) list of things to brew! Thanks for posting this - I certainly agree that the Biere de Garde style falls between the cracks and gets overlooked. Definately let us know how this turns out, as this has peaked me interest in brewing one in the near future. This one still has another month or so to lager, but it looks like it is already clearing up nicely. I'm debating whether I should bottle it or keg it, seems like a dangerous beer to have on tap, but I've already got a couple beers in need of bottling. How much water did you collect for the initial mash? Much thanks for all you share on this site! This recipe became the foundation for my fall beer, modified with some Special B and cinnamon, coffee, and peppers in the secondary. I've learned so much, so thank you! Cheers.